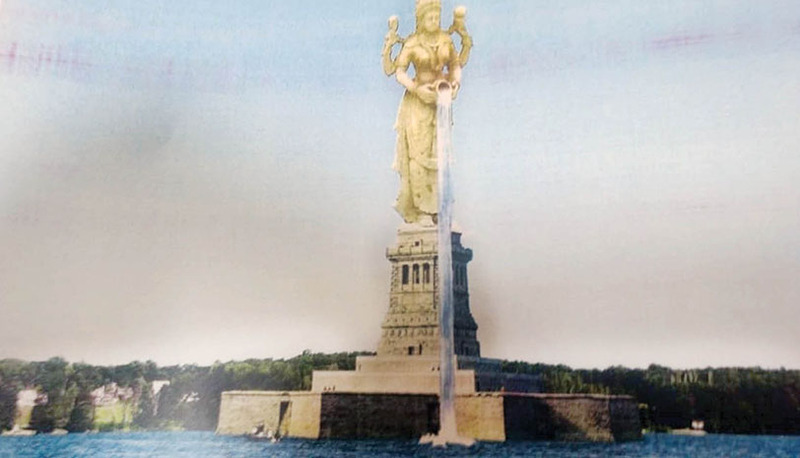 The proposal of the JD (S)-Congress government in Karnataka to build a 125-feet statue of Mother Cauvery (artist’s impression in picture) is unethical as the government headed by H.D. Kumaraswamy has meted out shabby treatment to the children of Kavery who suffered severe hardship during the recent landslides. This report is not intended to go into the ‘scam in the making’ (it will be a scam no doubt!) in the mega Rs 1,200 crore project to be built at the KRS dam near Mysuru, fashioned on the lines of USA’s Disneyland. Nor the report is interested in the ‘statue politics’ sweeping the country. Before proceeding further, it should be noted that river Cauvery takes its birth in Kodagu (Coorg), and the tiny district contributes a yield of around 400 TMC of water, out of the 790 TMC total yield in the Cauvery basin. Being the main catchment area of the Cauvery, Kodagu has to bear the brunt of floods as it happened during the August rains which led to death and devastation. Though the chief minister and other ministers made loud claims on the rehabilitation of thousands of victims of landslides, they were left to fend for themselves. The top priority of the Kodagu district administration led by deputy commissioner P.I. Sreevidya was to restore major road links damaged in the landslides, ostensibly to enable the movement of timber lorries. This was preceded by an order to lift the ban on the movement of Silver Oak trees. The other priority was to restore partial road link to tourist spots. Instead of catering to the needs of vested interests, the top priority of the government should have been to restore road links in villages affected by the landslides and build houses for the displaced people. All the promises made by the Karnataka government, including Rs 50,000 compensation to each of the victims, Rs 10,000 monthly rentals till the rehabilitation is complete and houses allocated for the affected, have remained only on paper. Except for a measly cash compensation of Rs 3,800, and the setting up of the rehabilitation centres, the government has not kept up its promises even three months after the calamity. Though the Karnataka government has set up an Authority to speed up the rehabilitation, there is hardly any movement on the ground. Except for identifying the land where the houses will be built, there is not much progress as the government has not set a timeline for the completion. It is an irony that Kodagu which contributes so much for Cauvery whose benefits are reaped by three states, does not even have a proper drinking water supply facility at Madikeri, the district headquarters of Kodagu. The Harangi dam near Kushalanagar benefits people in other districts, whereas most of the submerged areas are in Kodagu. In the circumstances, going ahead with a statue for Mother Cauvery looks vulgar, when the children of Kavery are in such grave peril. Politicians care only if the number of votes to be gained or lost is likely to be significant,This is the axiomatic truth.